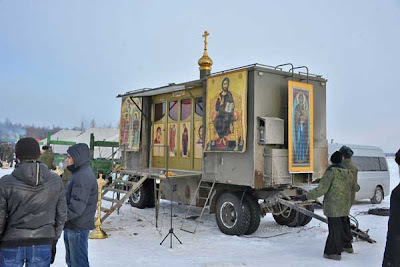 "Airborne priests and flying churches are set to fortify Russian soldiers’ spirits. Now priests who serve in the Russian Army will have to learn basics of military training to deal with an extraordinary device. A unique hi-tech air-dropped church will be introduced in the army. 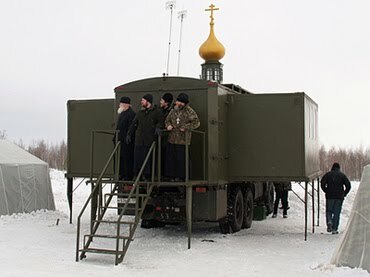 The church consists of a usual army tent and a life-sustaining module (a diesel power source, air conditioner and fridge). The chapel is put on the ground with an airborne platform used to carry armored vehicles and other heavy military equipment. As heated debate continues in the Russian government over rearmament and military spending, some enterprising army officials have found a way out. The airborne church is reportedly needed because there are special sacraments in the Orthodox Church that demand a substantial number of utensils. However some suggest the church could be used in order to bump up soldiers’ spirits. Others have a bold assumption that the project’s aim is to totally demoralize enemy with an unbelievable scene: a plethora of priests raining down from the skyline. 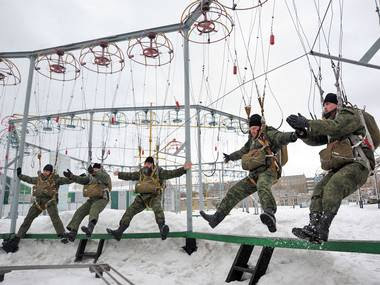 In order to match their new flying service, chaplains from the Russian Airborne Force will have to take part in military games in mid-March with their fellow-servicemen. They will not only practice parachute jumping, but also study the construction of a platform carrying the brand new airborne church. And watch this VIDEO . Tomorrow morning, Javier Arbona, Nick Sowers and myself will be convening at UC Berkeley to conduct a workshop for the Towards a Just Metropolis conference that is being held there over the weekend. The conference itself looks pretty good, lots of excellent presentors and topics coming together to further break down the tangled relationships between justice, spatial practice, and the city. If I had more time (and more money for an all inclusive conference registration ticket…oh the irony!) I would definitely be spending a lot of the weekend there. Be that as it may, I am really exited about our workshop – Decoding Military Landscapes – that will be held tomorrow from 10:45 – 12:15. Hopefully we will recruit some others who are interested in rethinking the meaning of the contemporary archive, the production of public knowledge, and the crisis of the spatial condition, to carry this with us further into development, at a time our political climate seems ever more cloaked in secrecy, and the nature of ‘metropolitan’ all the more radically hijacked by the spectral spaces of militarism. If everyone were to become an observer and register of militarization's hyper-urban and spacio-political expansion, then what kind of infrastructure could we imagine to facilitate this? 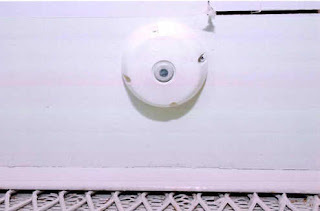 If we could turn the archival logic of the surveillance apparatus and the bureaucratic mechanisms of political secrecy against itself – or, if we could hijack the panopticon to, in effect, record itself and to measure its own dubious footprint which so far continues to evade public scrutiny – then what sorts of tools, what kinds of archival practices could be deployed towards the democratization of a new citizen monitoring of space? Could the archive not just be a measure of space, but a new public production of space; an open source archiving amounting to justice as a form of spatial practice? Anyway, that’s just a glimpse. And hopefully, this will mark the beginning of an evolving project that will come out of this over time. For some additional info, here is the official text for the workshop. 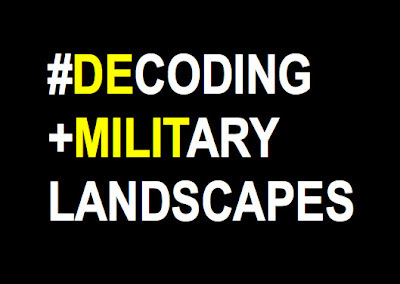 #DECODING MILITARY LANDSCAPES //18 JUNE 2010 (check website for final details) // A PARTICIPATORY WORKSHOP TO DEVELOP A PUBLIC ARCHIVAL PRACTICE: come join a working group that will brainstorm an open-source archival tool to catalog and examine the legacy of military urbanization. We want to begin with the premise that: the crisis of the contemporary spatial condition is produced in part by the hyper-expansion of militarization, operating in realms removed from public scrutiny and agency. Military space enforces conformity to a single prevailing mode and ideology of power. While space can be produced or transformed by a multitude of competing ideological claims (each of which in their own right may correspond to a certain context of ‘militancy’ and/or ‘militarization’), for this workshop military space is simply meant to connote the existing physical environment or imagined environments as these are configured by military power, including private corporations. This generic definition is intended to broaden the scope of what military space is, how it can be perceived in a spectrum rather than as spatial object, how it can be engaged, recorded—or archived—avoiding any preconceived idea about how military space does or does not manifest itself. The legacies of the military exist at every scale of our society, from the historic bunkers of old military bases and tourist landmarks of earlier wars, to more central monuments like the Pentagon and its constellation of financial towers that serve the defense industry. While the army base epitomizes the most literal entrenchment of military space, its sphere expands from the cordoned barracks to the terrestrially detached orbital satellite. The spatial dimensions of military power persist at the very core of our society on through the grandest public infrastructure, and continue all the way to the atomized in the form of RFID tags, biometrics, video games, GPS systems, and our SSNs. Suffice to say, the environment has always been constituted by the spatial forces of military evolution, but today hegemonic power only seeks to further erode any previous distinctions between ‘military’ and ‘civil’ space at unprecedented scales. Military space is now a pixilated blur of infiltrating actors —wealthy and legally insulated—whose logic poses great threat to the interfaces between ‘public’ and ‘private’, ‘human’ and ‘mechanic’, ‘transparent’ and ‘fortified’, ‘civic empowerment’ and ‘subjugation’. Why an archive? What is the political crisis of current archival practice? What should a public archival practice look like? Archiving has always been a critical task to the preservation of historic fact, national memory, and artifacts. However, with the rise in power of certain hierarchies and agencies responsible for this (from the Government to local historic preservation societies), the artifact has lost its potency, and a new political crisis of archiving has foisted itself upon the historical landscape. The artifact (the ruin, the memorial) is reproduced, or even manufactured, in the act of its preservation, and the more pertinent memories of political violence that are embedded within it are sanitized in order to make way for new methods of presentation. The military-historic legacy of a battlefield, for instance, is often stripped of its colonial details in order to meet a more suitable musealization of memory, and the artifact becomes yet a new weapon in the legacy of colonialism and in a war on memory itself. Further, the artifact is too often hoarded by the agency of the archivalists themselves, and become useless in the public’s ability to engage them with new purposes and for the making of a future knowledge or collective plan. This distance between the hoarded artifact and the public’s desire to study and repurpose the artifact creates a political void that suspends the artifact in a kind of historic formaldehyde, and defeats the purpose of archiving itself. If the evidence that society gathers and stores from history can no longer be used by the public to generate new knowledge then what is the point of archiving in the first place? We want to not only challenge the current practices of memorializing as a system of power, but to expose the techniques of this as they are rooted in the very production of military space. That is to say, the production of military space is intertwined with the politics of archiving and the politics of memory. We hope to explore and decode these in this workshop. The web itself, of course, is the archetypal example of a military-industrial complex archival practice, and the paradoxical nature of working with the web is up for critical examination as well. We welcome hacking and hackable project ideas. The hierarchies of archiving and the gathering and storing of evidence raise a number of questions about our informational society and the power structures of governance that arise from its practice. If the stated goal of archiving is to preserve history in a collective sense of the public, then we aim to challenge this status and the prevailing privatization of archiving as it is currently practiced. We want to start by asking, who are these archives predominantly designed to serve and who are they meant to exclude? If the results of archiving cannot be made uniformly accessible to all, then what is meant by ‘archive’? What comes out of this workshop? Come join us and be a part of the outcomes! We seek to reclaim the archive from forms of militarization and devise a tool or a practice that can be used by individuals and communities. Ideally, we would like this imagined instrument to be applied to the struggles against military urbanism in all its forms: “gang injunction zones” and designated “free speech zones”; Army recruiter-desiged video games and Second Life virtual space; nuclear waste transport corridors; privatized military housing, and so on and forth. Maybe it looks a bit like the Creative Commons badge and can sort search results. Maybe it persists through a Twitter hashtag such as #demilit. The archive will contain a diverse range of media from sound recordings to video clips. Whether it is hosted on its own server or on an existing social network, the archive will be open, dispersed, hackable and mutable. As such, we can make visible a more pervasive post-9/11 security landscape that eludes scrutiny. Through public dialog we will develop the concept for a new media-driven public broadcast project that can be of equal use to citizens, researchers, activist groups, historians, and a host of other communities struggling to confront the urban realities of militarization. During the workshop, we will synchronize the efforts of interested parties to produce a prototype of the #demilit archive . Who is leading this workshop? The organizers of this workshop [ Bryan Finoki Subtopia | Javier Arbona UC Berkeley | Nick Sowers Soundscrapers ] will offer their experience as military scholars and web creators to foster new collaborative and inter-disciplinary methods for conducting citizen research. Influenced in part by the work of experimental geographers like Trevor Paglen, and databases like the Center for Land Use Interpretation and Cryptome.org, we propose that art, photography, journalism, cartography, sound recordings, activism, historical archives, mobile technologies, social webs, oral histories and networks of physical exhibition spaces can be mobilized to record, expose, and redesign the vast dimensions through which military urbanism permeates cities and towns. Dear all. It’s been way too long for the eerie subtopian silence to not finally come to an end, I know (and appreciate your patience!) but I’m afraid you will need to appreciate the drippy echoes of our sealed bunker here a bit longer. But, I have several updates coming in the near future as soon as I have time! There was a trip to Detroit that was more than fascinating, and I just returned from a truly excellent and inspired weeklong workshop in Graz, Austria. There have also been some publications, and of course much to say about the two classes I've been teaching here at Woodbury; not to mention some future plans already in the works for next year. But, it will have to wait, I’m sorry. 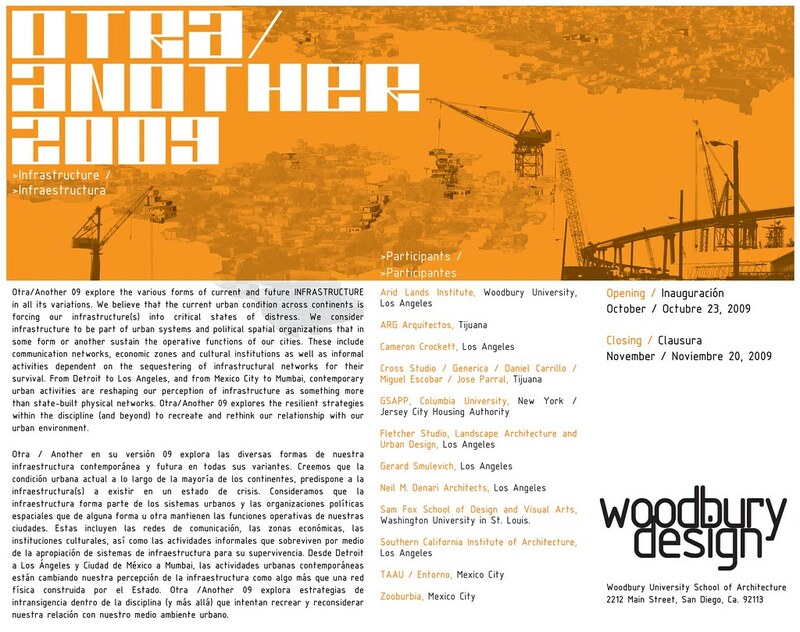 This is also working in conjunction with the next installment of OTRA/Another 2009, an architectural exhibition curated by my friend and colleague Rene Peralta focusing on the theme of Infrastructure, which will open to the public at Woodbury this Fri. evening. Go here for details of the participants. For now, lecture details are here: the show begins at 6:30PM at Woodbury University School of Architecture, 2212 Main St., San Diego, 92113. Hope you all can make it, and come say hello after if you do. Ciao for now, but Subtopia will have lots of news in the near future and hopefully get back on the posting path soon. Kabul to give diplomats an 'ordinary life' in Baghdad-style green zone [Guardian] // Pakistani military shows off captured Taliban base // US eyes private guards for bases in Afghanistan // U.S. Weighing New Road Rules for Troops in Afghanistan [Danger Room] // Danger Room in Afghanistan: Rebuilding Bamiyan // Danger Room in Afghanistan: Have It Your Way at Bagram? UK Anti-Terror Technology: 007 or 1984? So, part of the reason it’s been so quiet on Subtopes as of recent is due to some big news I’m excited to share here. 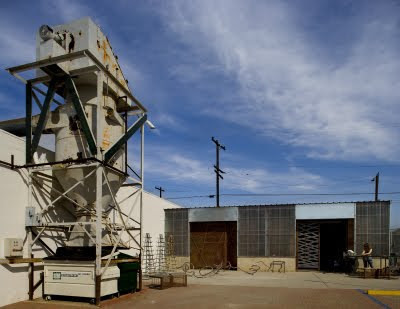 As it turns out, I’m heading down to San Diego to teach for the Fall semester at Woodbury University’s School of Architecture at their new campus in Barrio Logan down by the shipyards where the Navy constructs its sea arsenal. As you can imagine I’m pretty fired up about this, especially since the seminar I’ll be leading will largely draw upon Subtopia for framework. The title of the course is ‘Military Urbanism’ Vs. ‘Spatial Justice.’ Yet, as good as that sounds I’m finding it a huge challenge to distill and organize Subtopia into an actual seminar. It’s actually a very good exercise; think of your blog as a seminar, how would that make you rethink it? Regardless, after a few months of some serious structuring I think I have a good handle on how to narrate the class and am very much looking forward to it, not to mention how honored I am to have been invited. Hopefully the students will get out and find some crazy critical aspects to their city they’ve never noticed before, or just simply never stopped to really pay attention – which is the clearest goal; to help them interrogate the spaces around them. Yes, interrogate. To turn them into “spatial interrogators”, Subtopes-style. The class is going to be a survey of “military urbanism” starting with some historical background on the origins of the city as a political entity and the conceptual development of the nation-state, before moving through “military urbanism” as it is practiced in various parts of the world (e.g. Occupied Territories and the “War on Terror”), then onwards to the sheer omniscience of this stuff today. Borrowing from Krzysztof Wodiczko’s term “interrogative design” I hope to further develop our lenses for observing everyday space and the dimensions of our daily environments as they are inseparably linked with politics, state power, militarism, security, (in)justice, etc. The general idea here is that military urbanism in the end is not just some condition far off on the other side of the world in the Middle East, or on the battlefields of Afghanistan – but, rather is completely constitutive of our normal existence, of capitalism and urbanity itself, of the constructs of globalization and democratic space today. Military urbanism at the contemporary condition, absolutely pervasive, etc. You read the quasi-About page, you know the routine. San Diego is actually a perfect city for this since it has such an intense relationship with the military industrial-complex that I hope to really get out and measure with the students. The seminar will conclude thinking about what some allies of ours (whom you should know by now) have termed as “spatial justice” and how spatial practioners can respond to the ubiquitous nature of military urbanism. That is all really a short take on the syllabus (which I may post in full once the class gets rolling), but should give you an idea. Anyway, super excited. I hope to relay all of this on Subtopia in various dispatches over the next few months, so – even though it’s been a bit quiet in these parts recently, and probably will be for a short foreseeable future, there is the unfolding of all of this look forward to. Subtopia in a strange and cool sort of practice. 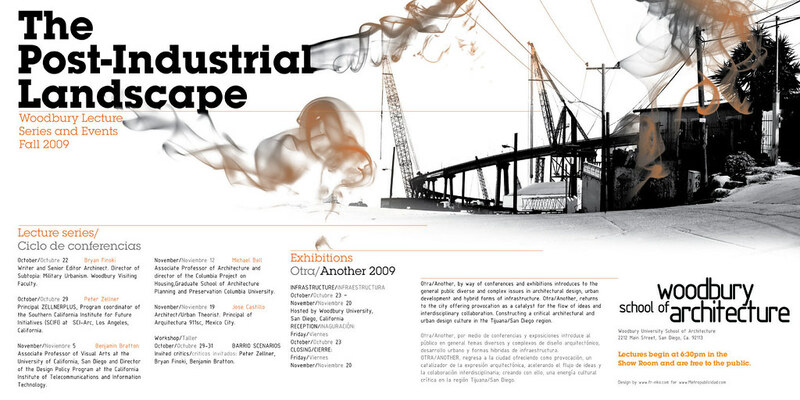 As if that’s not enough, I will also be co-teaching an urban design studio with my friend Rene Peralta (whom you’ve heard me before refer to as “the architectural mayor of Tijuana”), on post-industrial infrastructure as it can be developed and explored within Barrio Logan, a historic Latin American community that has fought over the decades to preserve a heritage there amidst redevelopment, post-industrial abandon, all in the shadow of the Navy. Sorry to be so low key, and to rush off again for now – but just had to finally let everyone know. If anyone has any suggestions for things/places/sites-to-see/activities-to-do/people-to-meet, please let me know. And any SD/TJ readers out there interested in meeting up at some point, I’d also love to hear from you. A nice three-part series of posts over at Moving Cities draws our attention once again to the rapid disappearance of the Hutongs in Beijing, which seems to have somewhat vanished from the conversation now that the attention brought to them during the Olympic Games has elapsed. It’s a cogent comparison I think, the disappearance of attention to the hutongs with their own physical demolition. Might we take it a step further and ask, has the media attention in some way been equally demolished? Or, has the effort to preserve the hutongs in Beijing merely given in and lost will to resist, and thus the scrutiny over them has followed? What is the real connection between the actual disappearance of the hutongs and the media attention that once hawked over the process? In some ways, I wonder, if even this post-Olympic phase is where the real damage is done, not only in physical terms to the neighborhoods but the real damage to memory as the public enters into a larger collective amnesia of the entire history of the hutongs. Included are some great photographs Bert has taken of a specific area that is being diced for the construction of the Gulou Dajie subway station; corridors of historic rubble, atomized memory bits, the urban masks of blue walls (which we have written about ourselves here), homes perforated by what almost looks like concentrated blasts of urban warfare, tractors ripping through the alleys like robotic droogs on a rampage, furniture left on the street as if abandoned elderly crouched and waiting to die alone. In an email exchange with Bert, I asked him: what if any positive memory archival projects are standing strong in all of this? Is there a sense that the Chinese are forfeiting a big part of themselves, or are there new forms of activism desperately trying to render something positive out of the rubble? From an architectural historian perspective, what strategies of archive could be discovered in this scenario? Is there something experimental that could come out of the demolitions? In part 2 Bert discusses some of the preservation efforts that are happening there, for example, "punctual preservation" whereby single elements are somewhat stored in the new structures. 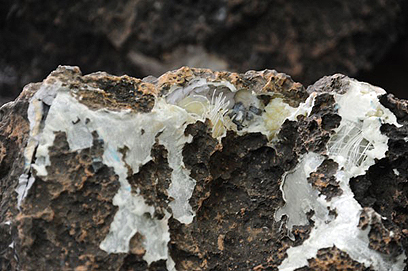 In the final 3rd part, he looks at what he calls “the celebration of the collapse of pre-Olympic “Beijing Hutong Preservation”-bubble” and details the “phenomenon of the hutong “fake-overs” and “paper preservation”. It is of course a very interesting topic for various reasons and from various angles. One could easily put this in perspective of New Orleans today, or Flint, Detroit, or even parts of downtown San Francisco for that matter, Tijuana, Gaza, Rio, the greater foreclosure crisis -- you name it. Redevelopment, or, the tragic lacks of proper redevelopment in some cases, are leaving places across the world in semi-erased states of manmade disaster everywhere, whether they're ordered by the evaporation of capital or are completely obliterated by the poorest of responses to natural disaster and war, the politics of redevelopment are leaving marks just as quickly as they are taking old historic marks away from the landscapes of memory. Glad someone is keeping watch. Thanks Bert for pointing us that way! Real quick, continuing on the topic of Palestinians finding ways of transcending the Israeli siege by utilizing the rubble of their own destroyed infrastructure – or what I guess I have referred to as acting “over the siege” rather than “under” it; “over” in this sense signifies that the Palestinian people are acting in plain view using the ruins wrought by the siege as resource for reconstruction, while “under” would mean having to conduct life out of view as through the tunnels underground. 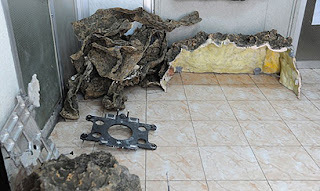 Again, due to the siege which prevents vital materials like concrete from entering Gaza, critical infrastructure such as sewage plants that were severely damaged by IDF assaults are left to rot and leave thousands of people without basic services like water and sanitation. Firstly: it is unfathomable to me that damaging this type of infrastructure is not a war crime; secondly: the fact Israel blocks the necessary building materials from entering the country to repair this is unconscionable; but, finally, thirdly: it is perhaps the most symbolic act of all right now on the part of the Palestinians and the international community together to use the bitter pieces of the Israeli Separation Wall to put their own nation back together again -- to simultaneously disassemble the wall and reconstruct the ruins of their own society. Just too important for me not to note here. The upgrades to the treatment plant, which are being made in cooperation with Rafah municipality and the Coastal Municipal Water Utility, will help prevent serious risk to public heath and further harm to the environment. In addition, the treated sewage water will help fill the underground aquifer, which is the sole source of water in a territory suffering from a severe shortage. We will be keeping an eye on this topic in the future. This is hardly breaking news by now but needs to be mentioned here as we try to return to our own temporarily abandoned excavations at Subtopes. Forgive the two month silence; breaks were needed to tend to other business, and for some exciting reasons that I will be relaying shortly. For now, we’re rolling up our sleeves and activating the bellows to our air hoses again – it’s time to surface with our tunnel gear and get Subtopia sinking down below again. When we say surface that’s really just code for digging in again. As you may or may not know at this point the recent Israeli annihilation of Gaza which commenced just two days after Christmas of 2008 and carried on for weeks crossing over the new year, left an estimated 400,000 Gazans without running water, and at one point 800,000 without working electricity and lights, while roughly 5000 homes were critically damaged if not totally destroyed, casting tens of thousands into homelessness in the decimated contours of Gaza’s rubbled craters that suddenly supplanted their homes, industries, and neighborhoods like massive footprints of airborne berserkers that never actually touched ground. It was one of the quickest and worst plunges into manmade disaster the world has witnessed in some time, and the density of the area certainly didn’t help to soften Israel’s blows. It was a lesson in manufacturing scaled abomination. -- thousands of dunams of agricultural land razed. And that probably only covers a portion of the footprint. Needless to say, Gaza was pretty much brutally battered. Disproportionately so? -- (as in, the attack was a non-justifiable over-response to the constant volley of Hamas rockets) -- well, just about everyone in the world except the IDF seems to think so. But, no one can say this wans’t out of character, either. So, given this as the starting point for this post, next thing you ought to know is that reconstruction efforts have been utterly stymied, by various political forces naturally but largely due to Israel’s refusal to allow the most basic of needed supplies like concrete, steel, and even glass to enter into the strip at all claiming those materials would only serve Hamas’ efforts to rekindle its armament and offensive capabilities. Egypt has fallen more lockstep in line with Israel by enforcing its borders while the US has thrown in some tunnel detection technology for testing. But, there is a lot more to the siege than that and a lot more Israel is doing to effectively strangle Gaza -- but, again, I will leave you to your own devices there, too. 4 billion dollars were initially pledged by the international community to help rebuilding efforts, but the money has since sat frozen, unspent. As long as Hamas would be responsible for the financial management of those funds, no one feels comfortable actually releasing them. It’s a mess of the most urban dismal kind, really. And there the innocent people of Gaza sit waiting, choking, assembling for some signs of hope to spring from their wasteland. Though, I’m hesitant to call them smuggler tunnels myself because “smuggler” seems to do the proud and resourceful Palestinians a gross derogative disservice in my view; to attach a stigma like that to these trade routes which for all intents and purposes are the only linkages to the outside world keeping them alive, just seems like more dangerous linguistic othering of the Palestinians than any really useful reference at this stage. I mean, when you’re forced to smuggle, by sheer necessity of survival, due to forces completely outside of your own control, when the power to decide your own destiny has been taken from you (as a nation), can it really be called smuggling anymore? Further, can smuggling really be considered an illegal or illicit act in this case? The very use of the word here to me seems to play into the feral-ization, if you will, of the Gazan people – it helps portray them as uncivilized subversives and criminal traders. I call them, simply – Gaza’s border tunnels. Regardless, these tunnels now all the more seem to be proving their true worth and resource, perhaps even evidencing further dimensions of some of their political innocence. As you may remember, the tunnels were heavily targeted by the IDF because many were suspected of being used to smuggle arms for Hamas across the Egyptian border. While some were (and still are, for all we know) used for weapons, many if not most by that point were really only serving as the economic lifelines of a people who had no other means for accessing the bare necessities of life, since both Israel and Egypt control all of Gaza’s borders. The strip is literally severed and somewhat de-sovereignated by the Israeli siege, and the tunnels represent the frontier of Gaza’s fight for geo-economic autonomy. Yet, how the IDF chose to target and destroy (or attempt to destroy) those tunnels and to what degree the intelligence and effectiveness of those bombing campaigns were accurate, we will never fully know. Yet, the tunnel trade is still largely in tact, also to the extent that it is really almost a myth as to how many tunnels still operate (but think somewhere in the hundreds), and in some cases are even more fortified than ever before. For the most part they are still delivering the same harmless goods they always did: livestock, laundry detergents, cigarettes, basic fuels, toys, and chocolates. The tunnels obviously fascinate Subtopia for several reasons: their epic versatility and historic resilience as a sort of timeless script of terrestrial fossils inscribed into the earth that has served humanity as a great epochal crutch many times, but in this case also because of the specific ambiguous nature of target-production they presented for the IDF. On one hand, the tunnels might be considered legitimate military targets (i.e. weapons smuggling tunnels), while on the other the tunnels (which had just prior to Israel’s attack been legally sanctioned by Hamas as national infrastructure to be regulated through taxation and labor laws) – were civilized and had nothing to do with weapons smuggling, militant armoring, or any other such violence-towards-Israel associations. Hence, the ambiguity of a dual-use target. However, I always thought this was a perfectly designed outcome of the Israeli siege that would in the end ensure a convenient excuse to destroy the tunnels. Basically, by forcing the Gazan economy underground the IDF made a suspicious target of the entire tunnel trade infrastructure. By tunnelizing Gaza’s economic corridors they forced them into a blurry indistinguishable context shared with the weapons trade, thereby making it much easier to get away with annihilating all of the tunnels rather than singling out the military tunnels, whether they were legit targets or not, and ultimately attacking the larger infrastructure in order to further the effects of the siege. It no longer even seemed to be about deciding on what is or is not a legal target anymore. The IDF in some way essentially preemptively produced their own targets in Gaza by virtue of the effects of the siege. Can targetting the tunnels be considered an act of urbicide? 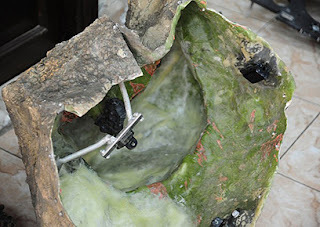 Yet, as we said, not only did many of the tunnels survive those overwhelming bombing barrages (bombs which still fall on them today), but many have found their routes even deeper underground now able to avoid conventional detection technology, and resist fatal damage from the blasts. More importantly, the tunnels themselves have yielded tons and tons of valuable mud that have spurred new hopes in rebuilding efforts despite the siege, the atrocious geopolitics, and Hamas’ own barriers in this process. Hamas is actually supporting the mud-brick housing movement and has pledged money and assembled a special engineering committee to investigate a pilot project that will test a multistory school to determine just how safe and plausible building more widespread with mud brick can be. Of course, all of this has spawned a new temporary economy in tunnel mud removal and brick manufacturing, and the engineering itself is quite antiquated but none the more outdated. They’re using combinations of mud, sand, salt, and straw, and in some cases rubble to forge bricks and build basic homes. Some have already been said to have withstood elements of winter rains and harsh summer sun. And so, the ingenuity of the Gazan people goes on! With these story lines it’s all the more interesting to think of this housing not just as autonomous innovative refugee mud brick sheltering (something AFH could certainly appreciate), but as extensions of the tunnels themselves, as architectural by-products, or even another form of economic tunnel products, if you will. It’s fascinating to me that the tunnels even in their destroyed state continue to assist the Gazan economy. Refuge spaces spawning from rooted industries below the radar to provide some of the only protective roofing in the area. It’s almost as if the tunnels had been turned inside out, sort of poetically unraveled overland as a result of the Israeli assaults, and now offer the dual benefit of both relief housing while also keeping the essential corridors of underground commerce alive. In some ways it’s just good old-fashioned poetic justice bound with some gritty irony. And for all Israel does to try and crush them, to expose and bleed them further to surface, their efforts have only shown to have driven the economic tunnels further underground while exposing how the tunnels can also serve the Gazan population in a completely humanitarian way, by being reinvented right there on the Gaza landscape for all to see in the form of shelter; the bowels of the tunnels regurgitated from the earth, reconfigured into neat stacks of the most needed thing of all – new housing, schools, mosques, new spaces of rebound. And so, the epic persistence and quasi-architectural resistance of the tunnels once again yields their amazing blueprints as uprooted spaces edited into fresh new infrastructure now in plain view. You might say, the tunnels in this "reused" regard have positioned the Palestinians in a small sense over the siege, not just under it, as the regular news headlines like to read when referring to the tunnels: Under the Siege. However, it begins to make us think and worry (maybe a bit paranoiacally). It is in other ways still a tragedy that the Gazans are being made to inhabit the tunnels (it’s one thing to force their economy there, but now their spaces of existence too? ), only instead of actually crawling down into them where many die daily laboring they are living inside them reconstituted above ground. One wonders by their very physical connection to the tunnels, will the IDF one day decide these housing structures are a threat, too? Is this merely falling into the strategy of anther IDF production of a Palestinian dual-use target? Not that the IDF ever needed any more justification than they themselves (and only themselves) have been willing to put forth in order to demolish Palestinian homes and structures, but I wouldn’t put it past them to claim the new mud-brick structures are somehow a threat to Israeli existence by virtue they’ve been forged by material from smuggler tunnels. Come to think of it, why would they stop there: perhaps the IDF will begin to claim that every Palestinian is a target for simply consuming and living off of the products that come through the tunnels, as a way to biopolitically engineer the entire Gazan population as a wholesale terrorist suspect having literally digested smuggled goods. OK, that might be a little extreme but then again the whole context is routinely terrorized by political and militaristic extremities. I’m not trying to fan the reality, really, but am very curious about how the ambiguities of what constitutes a legal military target and a dual-use target are analyzed and in some instances prefabricated. The notion of turning something into a target rather than deciding upon the legality of a target based on an international legal frameworks is nothing but precedented by the development of war, which has always been conducted not only on what a hostile threat has presented intrinsically but based on how militaries decide to view and classify targets by their own judgment and strategy. I mean, it’s probably much more simple than that: war wouldn’t exist without targets. And targets don’t just materialize out of thin air. They’re projected as much as they present themselves within the logic of war. But, despite advances in technology and precision grade weaponry, the target seems to be all the more confused these days on the battlefield, shrouded in urban counterinsurgency sure but maybe also purposefully and politically/categorically confused as well, and is often just easily written off as collateral damage. Just look at the ongoing spate of civilian casualties in the Afghan/Pak region brought by U.S. drones. A dangerous parallel seems to be developing: all the precision targeting weapons in the world don’t make much difference when the targets themselves become increasingly confused, and I don’t think the perfection of such weapons will be the tools to disentangle the ambiguous terrain of the dual-use target debate but may perhaps only further obscure the controversy. Which came first: confused targets or more precise weapons? Does it even matter? Both are being produced in their own ways, maybe even in some sort of unison. Of course, certain weapons respond better to a given target. To make a weapon perform at its own ideal, one might even design the target to accommodate the weapon. All of which is a very circuitous way of asking, how might the War On Terror be producing its own targets, to fit the scale of its military control? You may have read a few months ago the US began removing some of the street barriers that have propped up Baghdad’s security on a stilted network of blast walls and checkpoints for years, since—citing improved security—the Iraqi government is aiming to open all of the capital’s streets by the end of the year. As mentioned in this article, removal of the barriers is linked to “a security pact signed with Washington in November that requires US forces to withdraw from all cities and major towns by June 30”, (which some say is looking less likely already), “and from the country as a whole by the end of 2011.” We’ll see. At the peak of the sectarian violence 88 streets were closed in Baghdad, we are told, and if the article is accurate, the government has already reopened 75 percent of them. However, reading on officials also state that many of the “the walls and T-wall anti-blast barriers” would still be kept in tact while the Green zone itself, which houses the Iraqi government and the US Embassy, will remain completely barricaded. In Ghaith Abdul-Ahad’s 4 part video series for the Guardian -- City of Walls -- he traces the maze of concrete slab seemingly dropped from the sky into Baghdad to keep separate the Sunnis and Shiites, splicing neighborhoods and highways in half, and given how pervasive these walls still are all around the city it’s tough to imagine – despite the roads being opened – that Baghdad is getting on any kind of reunification track. Recently, Baghdad hosted a flower festival open in the streets to show how safety conditions are changing. But, as you know, there’s been a terrible new rash of car bombings recently that have taken hundreds of lives in just days, showing how tenuous the situation still is. Yet, we read in the New York Times, despite the violence and the continued presence of the walls (which we’ve written about here on Subtopia numerous times already) many of the neighborhoods – having once held “a prevailing attitude of can’t-be-bothered, as seen in the buildings that went unpainted, crisscrossed by tangled wires from generators and satellite dishes, or the bomb debris just left lying”; that “smelled always of generator diesel and often of dead dogs, which rotted by the roadside untouched for fear they hid an I.E.D.,”; and where any “splotch of green” was “covered with thick dust”; further, when “Iraq seemed a place painted in desolation, and decorated with despair” – many of these neighborhoods are now apparently being revived by a wave of small scale landscaping projects. “This is not at all to say that the ugliness of a war zone isn’t still present. It’s pretty hard to make towering blast walls into a thing of beauty, no matter how much paint is deployed. Mad Max fortifications are still often the rule. 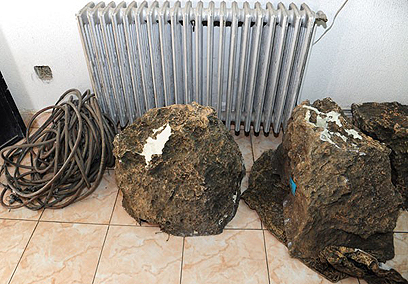 Hescos — antiblast protection consisting of big wire containers of rubble — defy all attempts at decoration. They’re just huge piles of dirt. There are still many areas of the city where no one seems to have figured out whose job it is to pick up the trash. However, if French businessman Jean-Marie Zimmermann has his way he will replace many of these concrete walls with trees and bushes and make the Green Zone truly green, he told the media recently. Apparently, the company has patented its defensive line of woven organic fences and is the first to propose using these types of natural walls at such a scale. "This is the kind of place where we can provide protection. We can remake Baghdad as a city focused on nature, ecology and the environment, with a new concept of security," he (Zimmermann) says. The principle is simple: plant a row of thorny trees and bushes 80 centimetres (32 inches) apart and weave the branches together. As the plants grow they form a dense and razor-sharp hedge that within three years can reach a height of six metres (20 feet). Zimmermann said traditional barbed wire, tyre spikes, sensors and even metal barriers can be placed within the hedges -- an invisible back-up layer of security. "A tank can go through but not a truck," he says. Not really sure, but sounds to me like just another green-washed marketing tactic to get a big government contract, and sell the notion that anything green automatically equates to better no matter how shallowly “green” may even be defined (is weaved foliage in conjunction with other barriers really more green? ); this also strikes me as ignoring the fact that simply greening the barriers doesn’t do anything to work away the need for them in the first place. In fact, it probably only helps cement the opposite: which is to say, masking the barriers will only probably contribute to a greater environmental acceptance of them in the long run and therefore help to sell their permanence, help to sell barriers in a more pleasant form, and thus might play into a more long term swell of Baghdad’s false sense of security, adding to negligence of pressing strategies and efforts required to truly work towards a situation where barriers no longer exist. You could argue greening the barriers might lead to greater danger in the long run, by deferral. But, to be fair, could the these green barriers slowly replace the current ones, and if so could they help lead to a removal of all barriers in the end, which would include these same green things themselves? Maybe. But, simply substituting barriers in various forms means nothing to me. Still, it might be interesting to dabble in what could happen if this traveling fortress-scaper gets to plant his heavy-duty strain of anti-terrorist blast trees and weave a crown of impenetrable hedges around the Green Zone. Say, over the course of several weeks Sinnoveg rolls through Baghdad in a tight caravan of armored trucks. A couple of which are covered in thick grasses and bristling shields that go darting down the road like two giant earth covered couches on wheels in a surreal advertisement of their product. Onboard a few are bundles of various trees stacked upon one another like a bed of precious missiles. Inside other trucks huge mattress-sized divots of crocheted foliage are hauled that will eventually be knitted together by a catalog of spooled root systems following behind them. Dozens of smaller pick-ups zip to the front and then to the back again with carpet rolls of specially grown sod and extraordinarily long and flexible coils of braided branches and treated sea kelps. Steady in the middle of the caravan military escorts move semi-transparent boxes the size of refrigerators cut for oxygen with bright green ferny tentacles ever so slightly poking through them -- they retract going over bumpy roads. The whole thing is a mysterious convoy of mobile greenhouses and nurseries scooting past Baghdad’s rubbled streets in a sunlit blur. In no time at all dozens of crews operating remote-controlled weaver-bots with interchangeable grapplers manage to drape the entire Green Zone’s heavily fortified perimeter in a terrestrial curtain like some old school camouflage tactic. From outside the zone this mangy green wall looks like a sub-natural island rising up from the battle encrusted core of urban Baghdad. A new Emerald City. An unihabitable island. Even though some sections of T-wall are removed many simply vanish behind the dense imbrications of unraveled hedge-walls and strategically planted trees that blow and settle into place all on their own like a great curtain being shook by a invisible hand – it instantly comes to life. It’s as if a militarized wreath the size of a small city bioengineered for war is placed around the Green Zone, the only thing missing from these massive grafts of vegetation are small populations of black-chinned hummingbirds, roboticized wasps and atomic desert butterflies, a few experimental DARPA-operated tree squirrels and monkeys, and perhaps a no man’s land strip of fallen dates and olives, pistachios and kamah truffles buried under rare patches of fence grass along the outside of the tree walls’ now excessively vibrant border. At first, everything looks hunky dory. Suddenly, a flase spring is in the air as if the Green Zone has been made a halo of photosynthetic wonder. Fragrant with intrigue of far-off gardens, the attitudes of embassy personnel and Iraqi interior working behind these lush enclosures (which have been green-guarded on both sides) are noticeably cooperative and chipper. Productivity levels spike briefly marked by the curtain’s sudden bloom. Invited by this refreshing circular arboretum everyone spends considerably more time outside sauntering along its tropical walkways where perfumes of hybridized barks and woods and floral blossoms are addictively inhaled over coffee breaks and Subway sandwiches, while the avenues the other side of the green curtain (despite being heavily patrolled) slowly fill with people from all over the city flocking to check out the Green Zone’s living security fence; it quickly becomes a very popular public attraction. Food stalls pop up. Informal literature is distributed explaining some of the exotic horticulture. 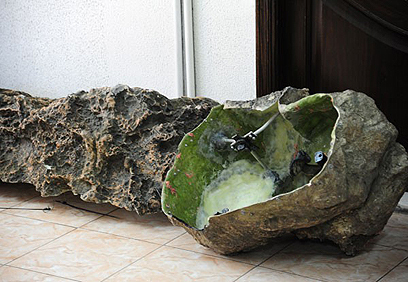 New flowers end up inside people's homes. In short, the green curtain seems to have won over everyone. But, as months pass through an oddly schizophrenic season dredged in torrential rains, abnormal wind chills coupled with ballistic heat spells, and a particularly violent sand storm that swarms Baghdad for a week leaving thousands plagued by wretched allergies, the fertile shield continues to grow, quite wildly in some parts in fact – so much so the entire thing looks weirdly out of harmony with itself, like a gangly teenager struck by uneven growth spurts in his limbs – the project soon requires incessant pruning in order for Sinnoveg to maintain its mastery of it. But the pruning is only good for so long. Propagating at frightening pace, the curtain first chokes off a couple key checkpoints into the Green Zone so they cannot be used again, at least until Sinnoveg’s emergency team of hedge techs can be flown in to perform serious amputations of the green wall. By the time they get there however the bulk of the hedges have grown far beyond any anticipation and Sinnoveg reluctantly admits they’re a bit unprepared to deal with the curtain’s manic growth. Meanwhile, Baghdad hacks through an allergic disaster sneezing violently and coughing up little sacs of blood, rupturing septums with incessant snorts and clogged bellows, flinging constellations of slime everywhere from their nostrils while simmering winds keep it all astir. Zimmermann’s hedge techs try to come out at first every month, then every week to inspect and saw away the excessive growth, but even they cannot believe their eyes. In the words of one supervisor, “the hedges have taken on more than a life of their own, they’ve gone completely mad – I think they’re possessed!” – they're no longer held in check by the harsh climate Sinnoveg anticipated making their maintenance work much easier. Another employee claims to watch a set of branches cultivate more than a foot overnight prompting the installation of surveillance cameras to monitor the curtain’s late night growth cycles. But the hedges soon crush them and they become irretrievable. “The climate here is having an incredible effect on the hedges, no one ever expected them to take off like this, certainly not here,” Sinnoveg’s chief botanist says at a press conference. Not only is everything spurting uncontrollably, he goes on to explain, but the entire thing has its own intelligence of weaving itself together in far more intricate and formidable patterns than Sinnoveg’s engineers can ever dream up. Unsure of what the hell to do the engineers simply take pictures and notes. By the end of winter most of the entry points to the Green Zone are completely stitched shut by feral vines, and Sinnoveg’s boys are more or less beaten down. Their weaver-bots working furiously in reverse all burn out. Their tools prove completely ineffective, and their ideas run abundantly low. Soon, one by one all of the checkpoints are sealed by this creeping drapery so impromptu emergency bridges are slung over canopies extending 30 to 50 feet high in some areas, where bureaucrats climb like nauseated refugees fleeing their own compound. With the help of the US Army Sinnoveg tries to dig a couple of tunnels below the curtain but the roots are tangled so deeply underground they are as impenetrable as the woven fences above. Most people remain inside the zone even more than they already do for fear the hedges will grow too much in a single day and they may not be able to get back in over the makeshift bridges later. Of course, all of this prompts major security concerns and Green Zone patrols are beefed up on the highest alert while new waves of tension ripple through out the city. Zimmermann now dangles in a thicket of bad publicity and like the Green Zone is going under fast. The Iraqi government calls in a special team of scientists to investigate the situation who immediately notices the Tigris’ River's water levels dropping frighteningly fast. Not only is the Green Zone’s new ecological upgrade completely taking over the compound but it is leaching the ancient water source in staggering amounts. More mild pandemonium sets across the city where random green parks have begun to spring up, strange patches of fresh growth in very unassuming places. Wandering gardens. Exotic alleyway flowerbeds. The city collectively sneezes. Operating inside the Green Zone is a logistical nightmare made worse by the fact that to completely abandon it at this point is not even possible because there’s no way to get everyone out safely without pulling off a helicopter mission military officials say would be too dangerous because it would expose everyone to insurgent attacks. Essentially, they're locked in. Food products and critical items are broken down into a continuous flow of smaller deliverables that have to be kept moving through a kind of stealthy aerial smuggling operation. All the while the mutant tree walls continue to grow and even change shape so they look less like walls and more like mounds leftover from ancient builders; the great wreath soon becomes a miniature mountain range ringing the Americans inside as if it were a green mustached volcano mouth. From the rest of Baghdad’s perspective, a jungly cloud has swept over the imperial zone and turned something heinously historic into an uninhabitable wild island. Where once a space between the Embassy and its own inner ring of walls functioned as a separate layer of security or as a temporary promenade with little shops dispersed along side other outdoor spaces, the rabid hedges and sidewinding green tentacles completely consume this zone and begin to latch onto the Embassy structures themselves; in some cases baby hedges hatch from inside the buildings. Offices fill with strange mosses, hellish tufts of weeds break through concrete walls into the shiny new dining facility, the America Club is quickly mildewed by funky algaes, and the hospital turns into an oversized salad bar. Hedges soon sprout everywhere, inside closets, under diplomatic beds, the embassy becomes a Sinnoveg archive of hedges. And there might be some truth to that. Not one supposed insurgent ever bothers to climb over this incredible concentric forest, especially not once the media announces that a couple US soldiers assigned to monitoring a temporary passage in the North West of the zone have disappeared and their bodies not yet found by the army, which of course triggers additional reports of Iraqi taxi drivers going missing near the curtain, and even some small children. Baghdad’s violence is actually rather quiet during this whole ordeal, ironically enough. It’s simply more urgent to watch the nightly news reports or even go see firsthand these rabid and viral gardens flourish in the heart of the city and claim the compound’s brutal architecture than to think about neighborhood violence. The gardens are forcing everyone out of the Green Zone like rats from a flooded hole, and the site of this alone has Baghdad in its grips and blowing their noses. Months grow thick and Zimmermann’s arrogant claim to make the Green Zone truly green haunts him across newspapers all over the world. But he refuses to leave and takes up a position atop a watchtower that pokes up from the center of the compound where he continues to order his scrambling mad technicians, at least those who have stuck around. At one point he instructs them to bail from their own car bombs packed with incendiary explosives at the heathen hedges, hoping this will blast through them. But the hedges are inviolable and the great curtain merely shakes the burning vehicular corpses off before consuming them. His men try everything from flamethrowers and ultrasonic weapons to high-density lasers to suppress the hyper lattice of stems and green cords cinching in on them from every angle, but only makes it all grow back and sew itself together with vengeance. As we said, all this time the political violence stops but few notice. Instead, the Americans manage to scramble to random corners of the city waiting for airlifts to other camps in the region while a local filmmaker surveys the scene on the ground with camera crews eager to capture the final days of the main palaces of Saddam Hussein – and now the imperial bunkers of the American regime -- as they are finally ready to be overtaken by an incredible surge of nature, to be toppled by no man but millions of mice and insects and tiny birds instead that suddenly spawn to pick apart the hubris remains of Empire’s overreach before everything in the zone is completely devoured and the cradle of civilization is turned into a swath of insatiable "greenery." For weeks Baghdad’s anxious crowds gather around the rough green edges to watch the modern fortress buried over. What seemed impossible years ago takes Baghdad by storm in just a few weeks. The film crews race around the brambly mess daring into it to get footage of the final days of the elegant marble building used by the Iraqi Governing Council before it succumbs to an army of woven knots and cables, prowling nooses, and the thuggish push of the Sinnoveg's rogue hedges. On televisions all over people watch the verdant cocooning of tin trailers and the slow grassy ground invasions of abandoned military camps and feeble barracks wilting under the vines and being consumed overnight like worthless shelter carcasses. Lightweight tent structures and abandoned vehicles drown in thorny thickets, while an empire of sprawling kudzu ivy spreads over the entire site and covers it and roughly all 30 or so buildings in the Zone so the media begins referring to a “green blanket” rather than “the green curtain” it once used to be. 100 acres of urban space suddenly turned into an orgying jungle spiked with modern ruins; the crowned jewel of empire now a giant bomb crater filled in instantly by fresh green earth; call it a post-imperial Oz or the greatest Crack Garden ever spawned, it’s the world’s “ultimate gated community” torn down by a spontaneous green yonder. Cameras hang from balloons and relay shots of the complex’s apartment buildings and the hospital disappearing inside layers and layers of green bubble wrap, with one last blocky concrete islandtop resisting the tree lines upon which Zimmermann stands on a wobbly chair. Looking down upon the green yonder with a tormented grin, a fiendish vortex of ferny tentacles lap at the base of his pedestal. He looks out over Baghdad and sees it besmirched by wicked plots of strewn greenery now. Lilypads swell in his eyes.